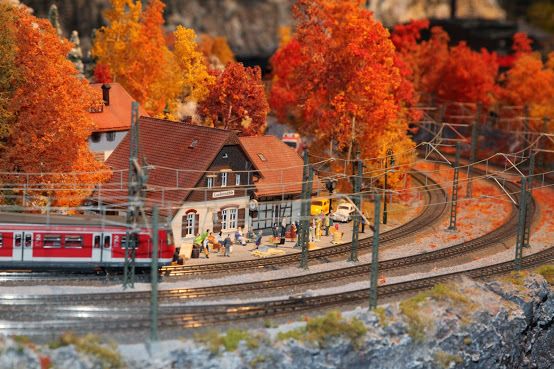 The story of this gorgeous Alpine layout begins with Alan Fisher, an Army veteran, who became intrigued by European trains while stationed in Germany during the Vietnam Era. 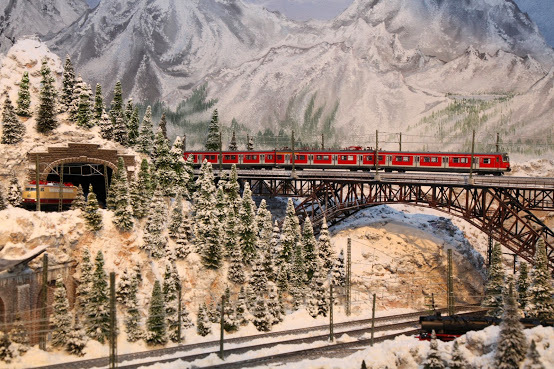 During the three years that he was there, he and his wife, both avid skiers, often had the opportunity to ride the train to a ski resort in the mountains. 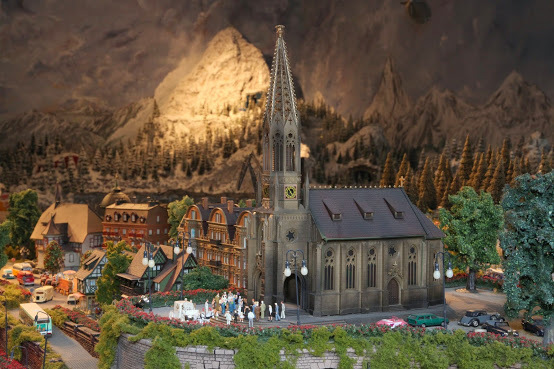 After returning home to Portland, Oregon, he began building a large free-lanced layout based on an imaginary Alpine scene focusing on an Austrian or Swiss city with a final destination of - you guessed it - a ski resort in the mountains. The layout contained two mainlines circling around and through the layout with two reverse loops – one going through the ski village and on though the main Bahnhoff area. There was an eight lane staging area built underneath the mid-portion of the layout with entrance and exit ramps 32 feet long. A 2 1/3 turn helix with a 3% grade was positioned under a large mountain and covered a Central Vac reservoir. 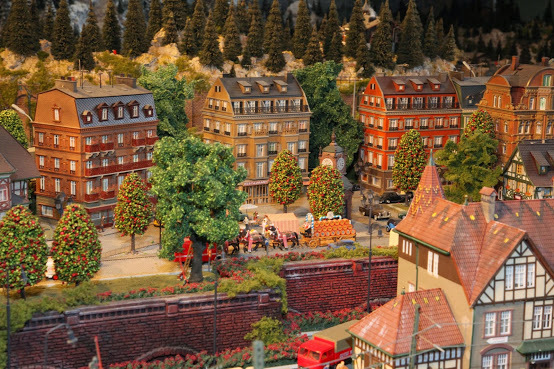 The electrical system was AC-3 rail, with two Marklin Central Stations controlling signals, lights and turnouts. Track was Marklin C.
The base was 5/8” plywood on oak legs inside an insulated and carpeted garage. Cuts were made in the wood base for the mainline tracks to allow a 2-3% grade to drop sufficiently to build out over the mainlines near the city where the roundhouse sat. The layout contained 7 lakes, mostly frozen, and multiple bridges. The vertical height between the staging yards and the main level was 9” and between the main level and the top level was about 10”. All grades were 3% or less. The colors reflect the four seasons moving clockwise, from autumn to stormy winter, then spring and finally summer. The autumn trees were handmade from Woodland Scenics materials. The rest of the 5000+ trees were from Busch, etc. The mountains were made with Sculptamold on a plaster cloth base, covering nylon mesh stapled to a 1x1” or 1x2” wood frame. Some of the areas around the city and ski village were merely sculpted 2” foam in layers. The bridges were made from Faller or Vollmer kits. A couple of them were kit-bashed to make them longer. Alan main supplier is Walter Menzel at Eurorailhobbies in Langley, Canada. He says Walter is a good man who knows trains well. All weathering was done with an airbrush. It took Alan all of 14 years to built this fantastic layout. He poured his heart and soul into it, but says he gained an immense amount of experience from it, some of which he wouldn’t want to repeat!